A 90+ year old Sherlock Holmes has to try and figure out what happened in a long ago case as he tries to deal with memory and health issues. The thought of Ian McKellen playing the great detective absolutely delighted me. It was, until the reviews hit, near the top of my must see list for 2015. Then word started coming out of the various film festivals that McKellen was great but the film was less so. I was so heart broken that I ignored it in theaters and waited until I had a free night to sit down and watch it. Sadly the film never quite worked for me. McKellen is quite good as Holmes, but the rest of the film just sort of misses. Blame it on the bassa nova if you like, but for me the problem is the story isn't really compelling. Holmes's memory loss gives the film a fractured structure as we see the story springing from his last case come to life. The problem is it never fully is compelling. I knew that the film wasn't a conventional mystery, or even a mystery, so I'm not disappointed in that. To me the problem is that the film is trying too hard to be mysterious when it really shouldn't be. Its as iff the film is trying to play at being a mystery because it's a Holmes story. 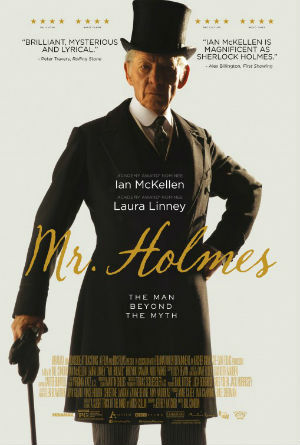 On the other hand the film has Ian McKellen as Holmes and frankly it he's enough reason to see the film. An okay Sherlock Holmes film isn't bad but still manages to disappoint.